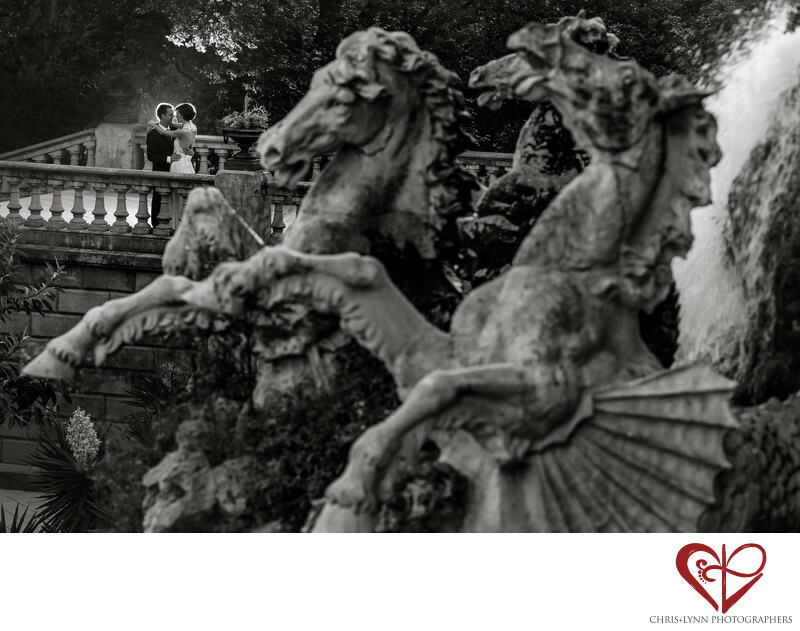 Sculptural horses, a waterfall, dramatic lighting and a happy in-love couple all came together to make this wedding photo. We photographed this bride and groom session long after the actual wedding day as a separate session dedicated solely to making creative wedding portraits that capture the couples' connection. While we encourage all brides and grooms to allocate an hour of time in the wedding day schedule, dedicated portrait time is a rare and cherished commodity! The timeline is often so tight that there is only 15 minutes for us to photograph bride & groom portraits - sometimes even less! At destination weddings, couples also want to spend as much time with their guests as possible. This is why so many of our couples will do another portrait session on a separate day - no rush to get back to cocktail hour, no limits on locations, and no worries about keeping the dress 100% pristine for the ceremony or reception! Couples tell us that these sessions are stress-free, give them time to relax & be themselves, and have some private connection time to reflect after the whirlwind of the wedding. We love them! 1/100; f/4.5; ISO 200; 135.0 mm.